In ultrasonic testing of concrete the evaluation of internal structure is becoming possible through improved equipment and testing methods. Some of the topics where work is under progress are thickness measurement, search for voids, and location of ducts. A number of researchers have developed techniques ready for application all requiring access of the concrete element from one side only . They are mostly adopted from other areas of non-destructive testing such as inspection of steel but needed modification to fit the special features of concrete. This contribution shows the use of ultrasonic SAFT-reconstruction to image 2-dimensional sections of concrete elements. SAFT (Synthetic Aperture Focusing Technique) is based on subsequent focusing of the data measured on an aperture to every point of the reconstructed area through superposition of the time records . The reconstructed image is in terms of impedance differences caused by, e.g., the back wall, and inclusions. 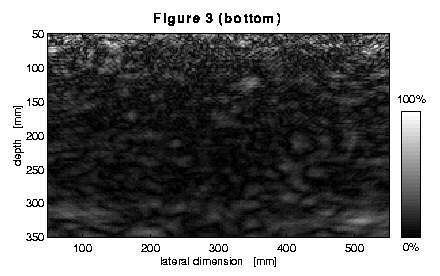 Main emphasis is put on demonstration of the applicability of 2-dimensional SAFT-imaging to the ultrasonic inspection of concrete. To explain why SAFT is especially suited for that purpose some of the propagation properties of ultrasonic waves in concrete are reviewed, and a comparison is made between SAFT and conventional A- and B-scan techniques. Some extensions to the fundamental algorithm are listed which are incorporated in the present implementation. Reconstruction results measured both in laboratory and in the field illustrate that SAFT is already applicable to testing concrete with grain size up to 16 mm and is a promising tool for the inspection of concrete with high resolution. Concrete is a two-phase solid material consisting of a mortar matrix and embedded aggregate with maximum grain size ranging from 8 to 32 mm. Of the at least three types of ultrasonic waves which may propagate in concrete usually longitudinal waves are employed for testing purposes. The incident wave is scattered at all impedance differences. To avoid the wave energy being exhausted by scattering of the aggregate alone ultrasonic transducers in the lower frequency range of 0,05 to 0,5 MHz are used. Still, the grain size is coarse when compared to the wavelength (between 8 and 80 mm at a longitudinal phase speed of cL = 4000 m/s). Any object should be clearly larger than the aggregate to be detectable. In general, millimeter-sized flaws can not be revealed. Strong signal attenuation arises particularly at high frequencies. The signal amplitude decays with increasing sound path, and the frequency content of the waves shifts to lower frequencies. Deterministic noise in the received signals hinders interpretation, coarser aggregate adding to its amplitude. Frequency dependence of the phase velocity (dispersion) appears. The shape of the transmitted pulse changes with increasing sound path, and the relation between transit time and sound path is non-linear. A pulse velocity is defined which is measured between certain threshold values of the envelope of the signals. For testing purposes one normally takes a macroscopic view of concrete and models it as a one-phase medium provided with effective medium parameters. They account for its special properties (one of them being the longitudinal phase velocity) while depending on a number of quantities. The goal is to account for all of these phenomenons but this requires the existence of a complete propagation model. Such a model is only in a rudimentary state . Finally, the effective medium parameters may also vary due to macroscopic inhomogeneities, e.g. the local phase velocity may be affected by the manufacturing process. Consequences caused by the use of relatively low frequencies are a broad divergence angle, and the increased appearance of Rayleigh waves. 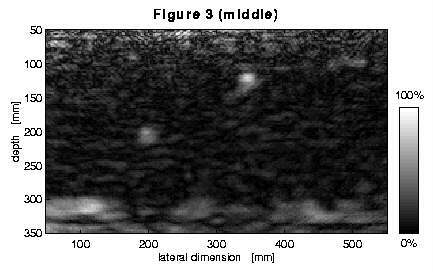 SAFT-imaging is not the easiest way to examine an unknown object using ultrasonic waves. 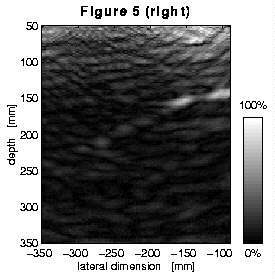 To explain its specific benefits when applied to concrete, a comparison will be made between SAFT and A- and B-scans which appear to be the most intuitive techniques in ultrasound, and are widely used. Table 1 shows some characteristics of these methods with regard to the peculiarities of concrete testing. Double exclamation marks are used to indicate the possibility of misinterpretation of data. The main problem with making an A-scan is that it contains too much information. One reason for this is the broad divergence angle, another is that the relevant information is hidden by deterministic (structure scattering) noise, by other wave types reflections, and maybe by stochastic (electronic) noise. The situations are rare when A-scans are sufficient to characterise a concrete element. B-scans require slightly more effort in scanning along a linear aperture but as the information unfolds into a second dimension the human eye is supported to interpret the patterns. Among the most significant features are hyperbolae indicating localised scatterers. Still, information belonging to the same object is distributed, and scattering by other wave types interferes. Artefacts induced none none likely !! In A- and B-scans, measured data is reproduced rather than processed. Through SAFT-reconstruction, every part of the measured data is focused afterwards resulting in an "image" of a section of the material. The broad divergence angle of the ultrasonic transducers is now a desired property since it allows the object to be illuminated from various sides. Because a number of aperture measurements contributes to each point in the image stochastic noise is suppressed. Normally, no need exists for extra high excitation voltages or non/linear averaging techniques. Aggregate scattering is localised in data space and thus spreads in reconstruction space only adding to noise. Wave types differing in sound velocity defocus and do not map into the image. Another advantage of SAFT is that it is graphic in principle. But although there is a one-to-one correspondence between the coordinates of the reconstructed area and its image the result needs to be interpreted. The SAFT algorithm was implemented using a numerical mathematics package. The program is able to handle the impulse/echo and pitch/catch cases. Data is always measured on a linear aperture which is why this algorithm is often called L-SAFT (line-SAFT). The algorithm works on the original data in the time domain, and reconstruction is done pixel-driven with linear interpolation between data samples. 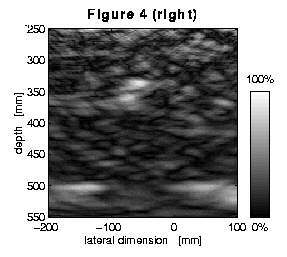 The resulting image is usually demodulated by calculating the envelope of its columns, and it is plotted in a linear grey-scale. Please note that reconstructed features start at the beginning of the bright spots rather than at their maximum. The time offsets are adjusted this way since many scatterers are not much greater than the wavelength and their contours cannot be resolved when using the maxima of the pulses. A reference signal measured without object may be subtracted from all data records to correct for late oscillations of the transducer. Manual amplitude adjustment of certain records compensates for variations of transducer coupling which can have a pronounced impact on image quality. Accounting for the divergence angle of the transducers helps reducing noise and artefacts. A nonlinear time scale may be applied to allow for changes in pulse velocity with increasing sound path. The corrective function is empirically found from measurements, so far for 8 mm maximum grain size only. This enhances the accuracy in the depth dimension. Amplitude depth correction equalizes scattering and absorption losses. 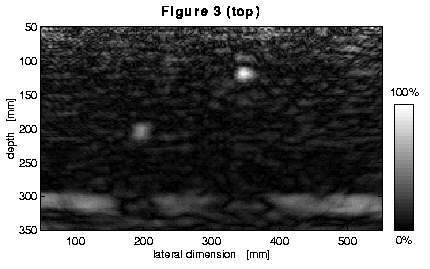 B-scans are used as a survey, and are plotted as high-frequency (RF) data in a linear grey scale where positive amplitudes become bright pixels, and negative values dark pixels. 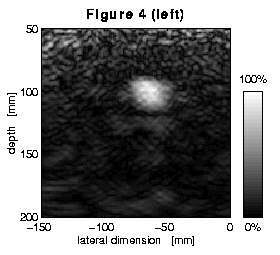 Ultrasonic data is recorded along a linear aperture on one surface of the test object. In laboratory, a mechanical assembly is used to assist regular spacing. 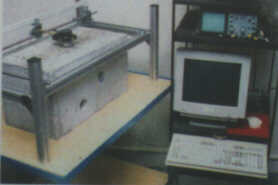 Figure 1 shows the set-up along with the electronic equipment and a test piece. Depending on the employed technique one or two ultrasonic transducers are connected to the commercial testing system NF-US 2700 of eng. office Dr. W. Hillger, Braunschweig, Germany. The transducers are excited by rectangular pulses, the measured waveforms are amplified and digitised within the ultrasonic testing system. Data post-processing and SAFT-reconstruction are done off-line on a personal computer. To test functioning and resolution of the SAFT algorithm laboratory experiments were carried out investigating three test pieces which are almost identical in shape but differ in their maximum grain size of 8, 16, and 32 mm, respectively. They consist of concrete B25, grading curve between A and B, and contain two drillings each as targets. While the mean geometry is depicted in figure 2 the actual dimensions vary by max. 1 mm. The specimens were scanned along a 500 mm aperture at a spacing of 10 mm. SAFT-reconstruction was done using the algorithm described above. The test results are shown in figure 3. For the MGS 8 mm and MGS 16 mm test pieces the top of the two drillings and the back wall are clearly visible, and they are reconstructed to their original places to within 1 mm (MGS 8 mm), or 3 mm (MGS 16 mm), with the exception of one drilling. The back walls show shadows of the drillings, the apparently varying thickness is probably due to variations in pulse velocity. The image of the MGS 32 mm specimen is much less clear, only one drilling and some part of the back wall are more or less visible. 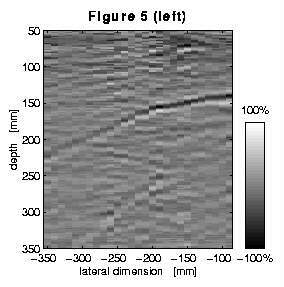 All reconstructions show significant noise down to a depth of 100 mm, and exhibit smoother contours with increasing sound path and grain size due to dispersion. It should be noted that the vertical size of the bright spots maps the ultrasonic pulse length and not the depth dimension of the drillings. Another test specimen was examined as part of a comparative test . It was made from MGS 8 mm concrete, and contains a post-tensioning duct 85 mm in diameter which was partly filled with cement. Figure 4 compares the results of two SAFT-reconstructions of the same, unfilled part of the duct: the left one being made from measurements from the near, smooth surface, the right one measured from the distant, uneven surface. Whereas the duct is easily located from the near side, the quality of the other image is degraded due to the longer sound path and the bad coupling conditions. Reconstruction artefacts blur the ducts image and account for most of the background noise. The ability of the SAFT principle to ease interpretation is illustrated by a field experiment. An accessible part of the bottom of a prestressed concrete road bridge is scanned to locate a hollow cylinder with a diameter of 1000 mm. The pre-processed B-scan of the measured data contains the main pulse trace as expected, and a second and third one in its middle and lower part, respectively (figure 5). The SAFT-reconstruction shows that the main trace focuses to a curved surface rather than to a point, and that the other traces are being discarded by the algorithm since they "don't fit" into the reconstruction scheme. Whether this is due to geometrical (multiple scattering) or pulse velocity (Rayleigh wave) reasons must be left open at this point of examination. SAFT images of high quality require good measurement equipment in the first place. Low frequency ultrasonic transducers are rare which are free of ringing and possess a broad bandwidth. This is especially true for transducers in the range of 50 to 100 kHz adequate for testing concrete of 32 mm maximum grain size. A parallel measurement of all aperture points would greatly reduce the time needed for data acquisition. Research is under way to employ laser interferometry , and transducer arrays . Where conventional ultrasonic transducer are used fast and reliable coupling is still a problem. The SAFT reconstruction could be made nearly on-line by using signal processors and/or parallel hardware, and close-to-silicon programming. Algorithms incorporating Fourier transforms  could be used if they are flexible enough to handle the special processing required for testing concrete. At any rate, many experiments are to be carried out to gain further insight into the functioning of SAFT-imaging when applied to testing concrete.